Physical limitations of some kind or another are responsible for the majority of swing faults for most golfers. Many swing faults are generated through poor technique throughout the back swing and are the result of poor flexibility, strength, posture and stability throughout the hips, lower back, abdominals, shoulders and legs. Regardless of level or experience, most golfers are affected by these areas of potential weakness and limitation. Possible swing faults caused by poor flexibility through the backswing include loss of posture, flat shoulder plane, reverse pivot, reverse spine angle and sway. During the backswing, the physical limitations are very easy to define. All components of fitness are required during this technically challenging phase of the swing however in this article we will cover flexibility only. At least 80% of golfers lack sufficient flexibility through the hips and shoulders to get into a desirable position at the top of the back swing. The bad news is that’s probably you. The good news is that both these areas of can be improved considerably from a properly designed flexibility program. There is no one size fits all approach, and once the precise physical limitations have been identified, we can then proceed with an accurate and specific flexibility routine to improve your back swing position and swing mechanics. Let’s go through the swing phase to determine some more common physical limitations and exercises to correct them. From address the shoulders start to turn. Here you need a strong lower base of strength to maintain good hip stability and prevent any early hip rotation. 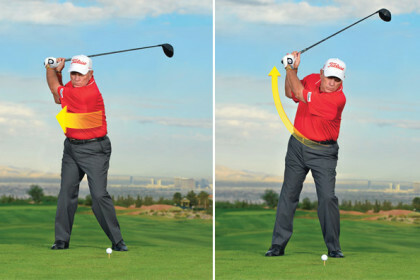 As the club continues to rise, and the hands reach hip level, the hips start to turn and your body weight starts to shift from front the back. This would mean the weight is shifting from the left foot to the right foot for a right handed player. A lack of flexibility through the left shoulder will prevent you from maintaining a strong postural position. Therefore to get the club into a higher position the body will do one of two things, if not both. One, you will start to lose your posture, your hips will move forward to leverage the shoulder joint and your club into a higher position. This takes you out of alignment and makes it very difficult to correct your position for the down or forward swing. Two, with the extra extension in your spine it will be virtually impossible to attain good shoulder position. To compensate, your left shoulder will be forced to externally rotate resulting in a flat shoulder plane. Lets wok on these flexibility limitations. The two primary muscles responsible for restricting your back swing are your Deltoids and Latissimus Dorsi. Both muscles cross the shoulder joint and are prime movers. Both of these muscles are in a static phase of contraction, meaning they are lengthening throughout the entire phase in preparation for the transition and downswing. It is our objective to then lengthen and improve the flexibility of these two major muscle groups to help you get into a more desirable position with less effort, and without losing your posture. The following flexibility exercises will help you achieve a better shoulder turn. – Standing tall with your feet shoulder width apart, extend your left arm and keep parallel to the floor. – Bring the arm in and across the front of your body and place your right forearm vertically and against the forearm, just in front of the elbow. – It is essential to completely extend the elbow of the right arm to create a sufficient lever for an effective stretch. – Hold for 30 seconds and repeat on the other side. – Now take a 5 iron posture, and perform exactly the same stretch. 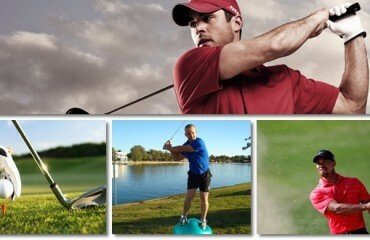 – Maintain complete hip control and stability. 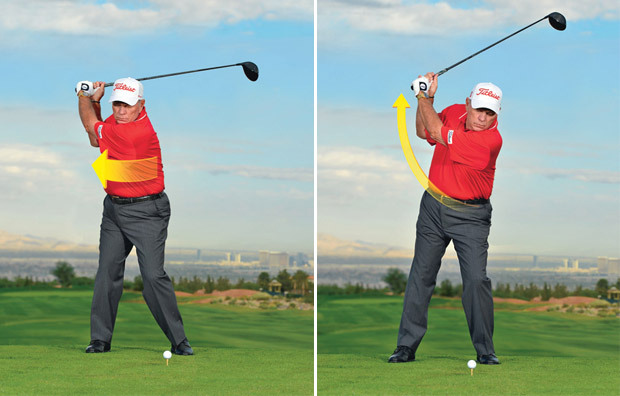 – Do not rotate the shoulder, no shoulder turn and keep the shoulders square and parallel to the ground. – Kneel on the ground, and extend both arms out in front of you. – Keep your bottom in contacts with your heels and slowly walk your fingers out in front of you till you feel the stretch. – Now take your left hand and place 11 o’clock. Move your right hand and place next to your left hand. – Extend your right arm further and walk your fingers out until you feel the strong stretch. – Stand with your feet outside shoulder width. – Extend your arms above your head, careful not to compress your lower back. – Take your right hand and grab your left wrist. – Tilt to the right hand side, and pull/extend your left arm up towards the ceiling! – The objective is not to bend as far as you can, rather to extend high and long. – Now slowly rotate to your right and reach as far behind you as possible. Here you have 4 very effective stretches to improve upper back and shoulder flexibility to improve your range of motion on your back swing and help you play better golf. I recommend you perform these stretches every day for maximum benefit and make them a part of your pre-round warm up also.